January 2018 Have you considered a back-up pump? Should you consider a second, back-up pump for your basement conversion? In the event of a power failure coinciding with storm and flood conditions - which is not an uncommon event - it can be advisable to have a secondary battery-powered pump in place to prevent potential disaster. After spending money to damp-proof and convert your basement or cellar, the last thing you would want is to have the finishings, furniture and contents damaged by flood. 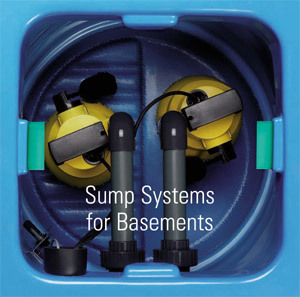 As we always recommend a sump and electrical pump to continually take away water and moisture from underground spaces such as converted basements and cellars, it is an ideal time to install a secondary back-up pump as a precautionary measure. This would provide peace of mind in a situation where the power is cut. The battery back-up pump would continue to protect your belongings and living space from risk of flood damage. If you would like further advice on whether a back-up pump is appropriate for your cellar conversion or basement project, we are always happy to offer guidance and suggestions. Call our expert damp proofing team on 0800 001 4213 or email us today for friendly, specialist advice.